All children deserve to experience the thrill and escapism of meaningful physical play. What’s more, it just takes a bit of thought and planning, and everyone can enjoy the exhilaration and magic that arguably only playgrounds can produce. Of course, more than anything it’s about social interaction – and in this respect no child should be left on the sidelines. This entry was posted in Resources For Parents and tagged accessible, children, play, playgrounds on January 29, 2014 by tjentz. 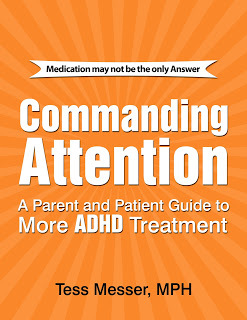 Written by a physician’s assistant and parent to an ADHD child, Commanding Attention explores the many conventional and unconventional treatment options for ADHD children and offers a personal insight into the world of ADD from a clinical perspective but delivers the information in an entertaining and objective manner. To purchase Commanding Attention: A Parent and Patient Guide to More ADHD Treatment by Tess Messer MPH, go here. 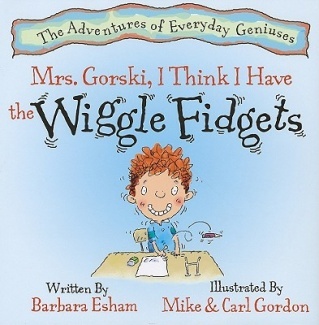 Written for young grade school age children, Wiggle Fidgets tells the story of, David and his struggle with ADHD in school. A guide written for parents with children suffering from high-functioning forms of autism, the text is filled with information for parents to help focus their child’s energies and talents into the appropriate channels and assist with social nuances and situations. 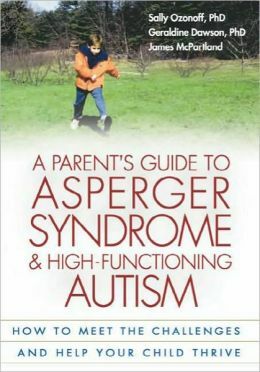 To purchase A Parent’s Guide to Asperger Syndrome & High-Functioning Autism by Sally Ozonoff, Geraldine Dawson, and James McPartland, go here. An autistic boy and his friend navigate social situations together and demonstrate that friendship has not limitations. Easy to read for young children. 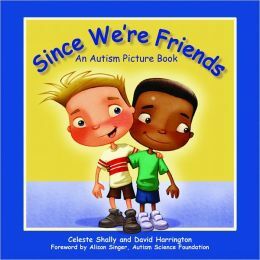 To purchase Since We’re Friends: An Autism Picture Book by Celeste Shally, go here. This book offers a hopeful perspective from an author that has first hand experience as the mother of autistic children. The text encourages working with the autistic child and their way of doing things rather than attempting to force the child to act in a manner that is contrary to their nature. 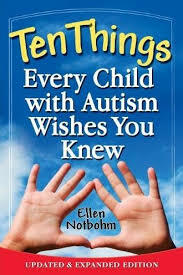 To purchase Ten Things Every Child With Autism Wishes You Knew: Updated and Expanded Edition by Ellen Notbohm, go here. The daughter of Chinese royalty was born blind but with the help of doctors and men of magic, she will discover a new way to “see” the world without the use of her eyes. Fairy tale-like depiction for children to enjoy. 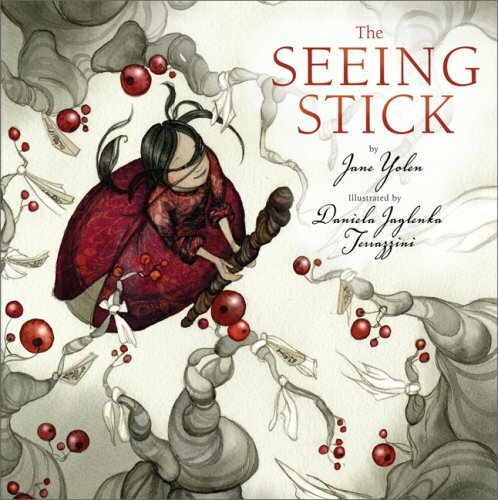 To purchase The Seeing Stick by Jane Yolen, go here. Book for young children about a musician having recently suffered loss of his hearing but discovering he can still create and enjoy music. Written by real-life musician, Pete Seeger. 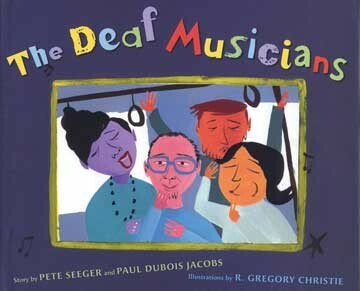 To purchase The Deaf Musicians by Pete Seeger and Paul Dubois Jacobs, go here. A guide for parents raising teenagers with diabetes. Includes strategies to get the teens to adhere to their diet and medication schedules and other recommendations and advice dealing with this difficult age and the disease. 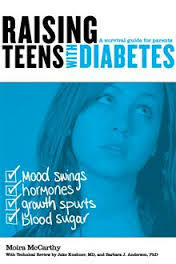 To purchase Raising Teens With Diabetes: A Survival Guide for Parents by Moira McCarthy, Jake Kushner MD and Barbara J. Anderson PhD, go here. An easy to read book for children that explains the disease in simple terms and helps the reader understand what it means to live with diabetes. 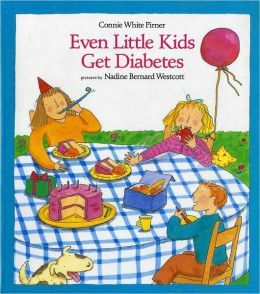 To purchase Even Little Kids Get Diabetes by Connie Pirner, go here. 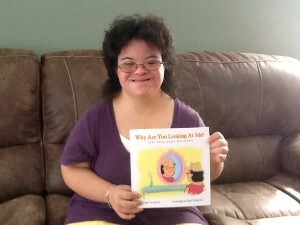 A simple children’s book about a girl with Down Syndrome that teaches acceptance of others. To purchase Why Are You Looking At Me? I Just Have Down Syndrome by Lisa Tompkins, go here. A guide written for older children about their role as sibling to a person with Down Syndrome. Packed with lots of important information and provides a reference for older children with questions about their sibling. 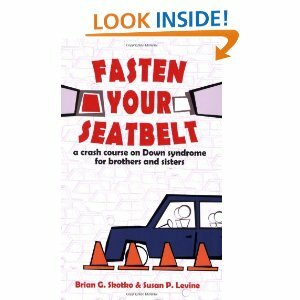 To purchase Fasten Your Seatbelt: A Crash Course on Down Syndrome for Brothers and Sisters by Brian Skotko and Susan P. Levine, go here. There are many emotional disorders and psychological issues but The Explosive Child covers one of the most difficult emotional problems: the angry, violent child. This book explores different strategies and approaches to dealing with, disciplining, and understanding a child that is prone to outbursts and unresponsive to limitations or traditional rule obedience. 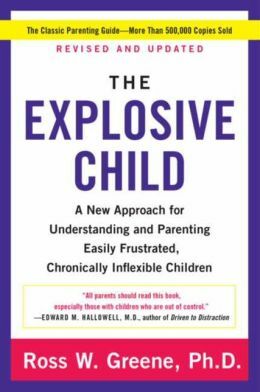 To purchase The Explosive Child: A New Approach for Understanding and Parenting Easily Frustrated, Chronically Inflexible Children by Ross W. Greene PhD go here. A book written for young children about a girl that loses her temper. The book helps the reader understand that becoming angry and expressing that feeling is normal but calming down and behaving appropriately is part of the emotional journey. 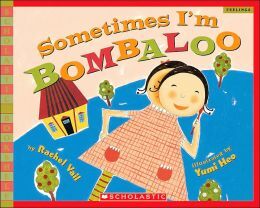 To purchase Sometimes I’m A Bombaloo by Rachel Vail, go here. A book for school-age children about a girl that struggles to learn how to read. Recognizing her difficulty, a teacher works with her to overcome her dyslexia and learn how to read. 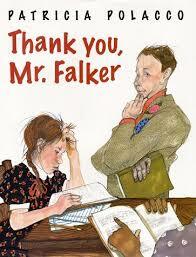 To purchase Thank You, Mr. Falkner by Patricia Polacco, go here. Book for children about a boy born without a left hand that shows his classmates that his disability does not keep him from doing the same things they can do. 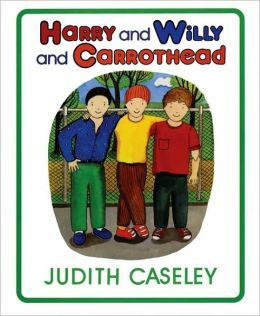 To purchase Harry and Willy and Carrothead by Judith Caseley, go here. A girl cares for her older sister suffering from cerebral palsy in this touching children’s book. 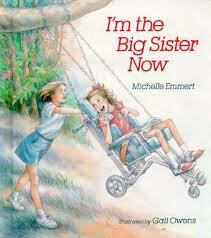 To purchase I’m the Big Sister Now by Michelle Emmert, go here. A book written for young children about a girl enjoying all the activities every children loves only for the reader to discover at the end of the book that the little girl uses a wheelchair. 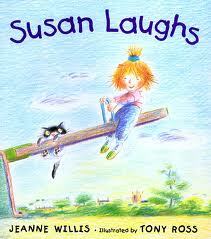 To purchase Susan Laughs by Jeanne Willis, go here. 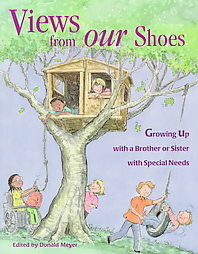 A compilation of essays written by children who are the siblings of children with a variety of special needs. The essay writers range in age from 4 to 18 and offer a unique and personalized glimpse into the world of growing up a person with special needs. This entry was posted in Frequently Asked Questions, Resources For Parents, Resources For Teachers on December 3, 2013 by tjentz. Raising a child with special needs can be difficult enough, but thanks to the worldwide web, the Internet is full of tons of informational websites that can help you and your little one. Below are twelve helpful sites that are loaded with useful information for parents with a special-needs child, including information on Autism, deafness, blind-deafness, hearing impairment, intellectual disabilities, multiple disabilities, orthopedic impairments, serious emotional disorders, specific learning disabilities, speech or language impairments, traumatic brain injuries, Down’s Syndrome, and more. You do not have to feel alone when there are so many other parents out there going through the same thing you are. These twelve amazing sites include information about your child’s condition, stories from parents who have been through it, local help guides, forums, blog entries, and learning tools. AutismNow.Org is hands down one of the best online resources for information on Autism. It includes latest news, information, an easy to use search engine, upcoming events, and even a local agencies map for finding help in your area. Coming in at a close second is Autism Learn , a site is dedicated to the process of teaching Autistic children how to learn. It is jam-packed with visually stimulating activities geared toward helping develop skills with people, fine motor control, creating a connected hierarchy, learning about the seasons and weather, money, and much more. Hearing Like Me is a wonderful resource for parents who have deaf children or hearing loss. Their website is clean, easy to browse, and full of helpful information. It also has an amazing forum where you can share your story and talk with other parents. This is an excellent resource for parents who wish to share their story and communicate with other parents who are going through the same thing. The Royal Institute for Deaf and Blind Children has a lot of information and services for parents of children who are deaf-blind. In addition to their resources, they help parents and their children get involved in activities, as well as provide latest news and updates in the deaf-blind community. The Hearing Loss Association of America is a great resource for any parent with a hearing-impaired child, as it not only offers support resources, news, recommended reading, personal stories, and articles, it also has a section on laws and how your child with hearing loss has rights. is a fantastic site for anyone involved in the life of a child who has language and speech delays or impairments. The site features tips to stimulate language development, a forum to interact directly with other families and speech-language pathologists, a wealth of links to other sites, a comprehensive reading list, and even a sign language section. Smart Kids with Learning Disabilities is an excellent and resourceful website for parents with children who have dyslexia, are ADHD, or have other learning disabilities. 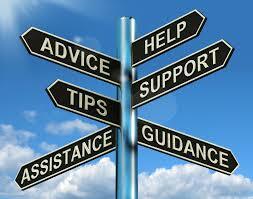 The site focuses on empowering parents with knowledge and a strong supportive community. It also has a section on success stories for those that may be feeling overwhelmed. Support for Families of Children with Disabilities has been around for a long time, since 1982, offering information to parents with multiple disabilities in children. It offers newsletters and resources, as well as upcoming events and services for educating parents and loved ones of children with disabilities. Orthopedic Impairments is a friendly website project with a comprehensive mission to inform, educate, and help walk through parents, teachers, and students with orthopedic impairments. If you are finding that you are having a difficult time communicating with your child’s school, they have a special section designed to help you through any bumps along the way. One of the most prominent mental health websites within the U.S., Healthy Place, offers an interesting and informative blog entry detailing the long and difficult journey parents of mentally ill children travel. Although the entry is short, there are over eighty-five comments from various parents and loved ones of children who have serious emotional disturbances and disorders, each with a story to tell. The Guardian has an inspiring article about a mother and her son, who has Autism. It discusses one of the biggest challenges a parent and their disabled child faces: other people. At the end of the article there are over 165 comments from others who have something to say about the issue, including information, stories people want to share, and support for those who are faced with these daily criticisms. If your child has a specific learning disability, such as trouble reading or communicating, then this site is for you. Not only does it have a section solely for parents, but it has sections for teachers, principals, librarians, and other professions. It is also available in Spanish. Brainline.org has an impressive guide for parents who have a child with a traumatic brain injury. It covers information on how to help your child adjust, cope, develop, and rehabilitate after an injury. It also helps parents understand cognitive changes in their child and has useful information into peer networks and gaining self-esteem. Though a controversial site, Lifenews.com offers a highly touching and incredibly heartfelt article about the parents of a child with Down Syndrome and what they need to hear. It discusses how parents can often times slip into depression, but that it is important to know that there is a light at the end of the tunnel. It focuses highly on the positive aspects of taking care of a child with Down Syndrome. While things may seem hopeless from time to time, it is imperative to remember that there really is no limit to what your child can accomplish, and that although he or she may be facing daily struggles that they will persevere. Although there are many people out there who are still relatively uninformed and unfamiliar with special needs children, it is important not to let hurtful statements deter you from doing the very best you can for your little one. It is entirely okay not to always know the answer, and it is certainly okay for parents of disabled children to find communities, programs, and other forms of support in which they are able to speak with others who share similar experiences. 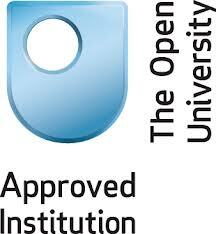 While the above links are not comprehensive and the only ones available, they are a good start. 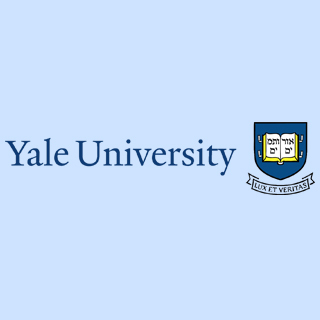 Many of these sites are also great resources for other sources and are not merely limited to the category in which they are found. If you are a parent with multiple special-needs children, you may find ChildrenWithSpecialNeeds.Com useful as it has information regarding just about any type of condition out there. What makes it remarkable is that it is run by parents, for parents. 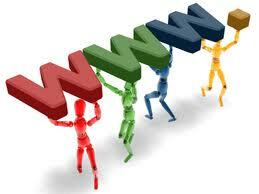 This site has several different areas of interest, including a large section on web links in easy to view categories. This entry was posted in Resources For Parents on August 21, 2013 by tjentz. 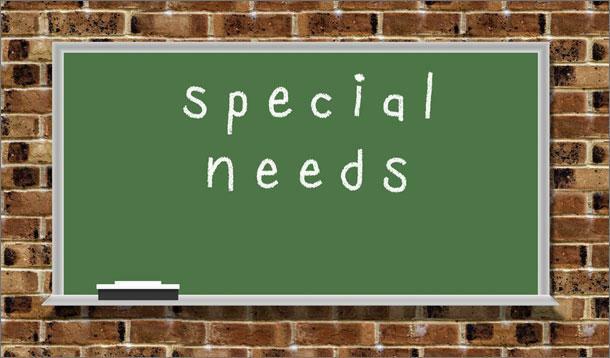 What Determines if a Child has Special Education Needs? Just as a parent is typically the first to recognize when their child is in need of special attention, when it comes to education, the parent plays one of the most important roles in determining if the child should be eligible for an Individualized Education Program (IEP). Nothing can begin in addressing the special needs of a child without the input of a teacher, physician, and parent/s initiating the IEP. This involves a parent requesting that the school evaluate their child. The school must have a parent’s written consent to perform this evaluation as it also sets the 60 day timer or the state’s time-frame constraint. IDEA 2004 and its preceding statute, the Education for All Handicapped Children Act, are responsible for the national funding legislation established to protect the rights of children who are eligible for the special education services outlined in their individualized program. IDEA 2004 specifically guarantees a child’s right to what is referred to as a Free Appropriate Public Education, or FAPE, within the least restrictive environment, or LRE. 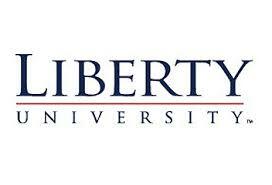 What all of that simply means is that funding and protections exist for children of special needs to help prepare them for the furthering of education leading to employment and ultimately, independent living. Parents must receive this finding in writing along with information regarding how to appeal and the various mechanisms available through which to resolve disagreements, including mediation. In addition, each state’s Parent Training and Information (PTI) center is one of the many resources available to help parents learn what next steps to take. Similarly, a parent may decline services that have been approved at any time. Suffice it to say, a parent has the right to change their mind about whether their child receives special education and related services. Reestablishing services is possible and may include another evaluation, again, in fairness to ensuring the child is receiving what is needed for them individually. It is important to have the right input both in evaluating the child and developing his or her IEP. Number one in this effort are the parents. In addition, there must be at least one teacher from the regular education curriculum and one special education teacher. Also on the team is a special education supervisor from the school system familiar with the regular education environment who brings knowledge of the available school resources. There must also be someone capable of interpreting the results of the evaluation and communicating those results to the rest of the team. When it is appropriate, the child may be able to contribute. 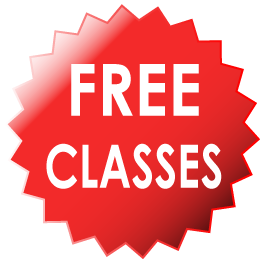 Parents may invite other knowledgeable individuals or those of special expertise, a relative or a child care provider. The school can contribute specialists of their own, such as a physical or speech therapist. The school may also invite any other agency representatives that may be responsible for either paying for or providing services and only with the parent’s consent. Once it has been determined a child is eligible for special education and related services, a meeting to develop an IEP must be held within 30 days. IDEA 2004 clearly allows for parents to contribute as equal partners on the team both in writing and implementing their child’s IEP. This plan will include the child’s present levels of academic and functional performance and in what ways the child’s disability affects this performance. Goals will be established for the upcoming year and what the team agrees upon that the child can reasonably be expected to accomplish. These goals are intended to accommodate the child’s disability while still being able to progress in the general education curriculum including the subjects of math, science, reading, social studies and physical education, among others. The IEP must also include the provision of supplementary aids and services such as a one-on-one tutor, preferential seating or devices that aid in communication. 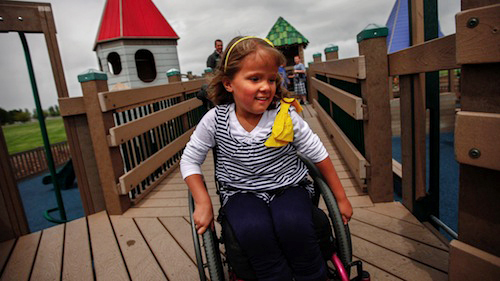 Accessibility makes it easier for a child with a disability to better take part in school activities. The IEP also details any changes to school programs or the school personnel support that will be provided. Further, the IEP must also explain how much of the school day will have the child educated separately from other children without disabilities and whether this interaction includes extracurricular activities such as lunch time or clubs. Reevaluation of the child’s needs are performed at least once every three years or as determined by the IEP team when there is a need for additional data. Again, there is a time clock started on this reevaluation 90 days from the IEP team meeting. It is helpful to know that IDEA 2004 provisions also apply to private or religious elementary or secondary schools in which the child is placed. 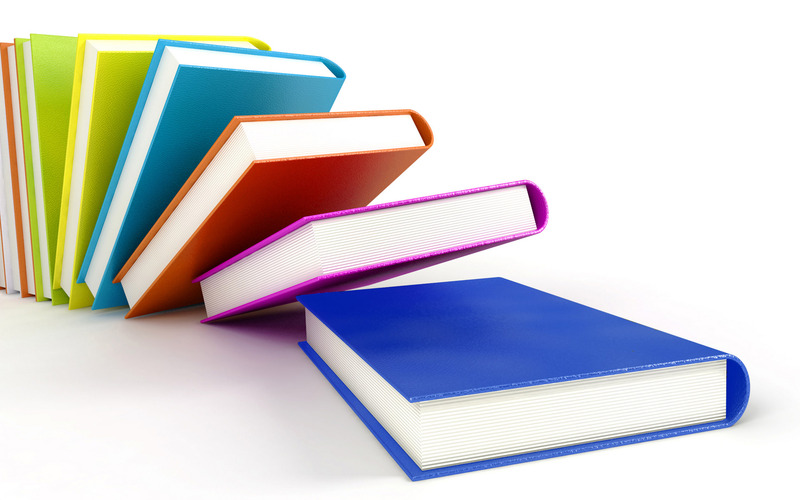 This entry was posted in Resources For Parents on August 18, 2013 by tjentz.